Antonio Guterres said that the US, followed by China, India, the Philippines and Indonesia, have experienced the most disasters since 1995 - more than 1,600, or once every five days. Antonio Guterres said the number of natural disasters has quadrupled since 1970. 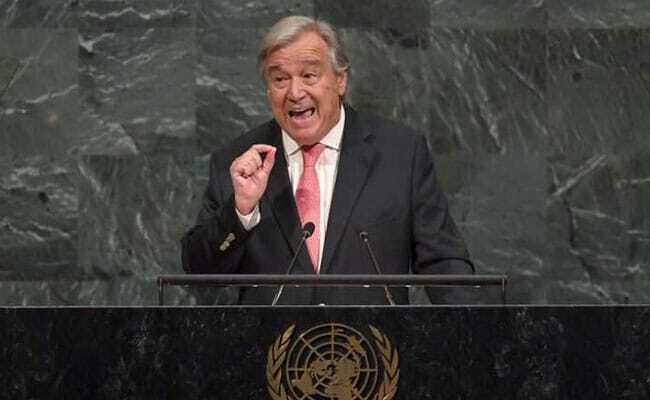 United Nations: India is the third worst affected country by natural disasters since 1995, UN Secretary-General Antonio Guterres on Tuesday said as he appealed the world leaders to implement the historic Paris deal with ever greater ambition. Addressing the high-level debate at the General Assembly, Mr Guterres spoke out in favour of the Paris agreement on climate change, saying extreme weather events like Hurricane Irma are becoming "the new normal of a warming world." "Climate change puts our hopes in jeopardy. Last year was the hottest ever. The past decade has been the hottest on record. Average global temperature keeps climbing, glaciers are receding and permafrost is declining. Millions of people and trillions of assets are at risk from rising seas and other climate disruptions," he said. He said the number of natural disasters has quadrupled since 1970. He said that the US, followed by China, India, the Philippines and Indonesia, have experienced the most disasters since 1995 - more than 1,600, or once every five days. "I stand in solidarity with the people of the Caribbean and the United States who have just suffered through Hurricane Irma, the longest-lasting Category 5 storm ever recorded. And Maria is already on its way. "We should not link any single weather event with climate change. But scientists are clear that such extreme weather is precisely what their models predict will be the new normal of a warming world," he said. "We have had to update our language to describe what is happening: we now talk of mega-hurricanes, superstorms and rain bombs. It is time to get off the path of suicidal emissions. We know enough today to act. The science is unassailable," he said. The appealed the governments to implement the historic Paris Agreement with ever greater ambition. "I commend those cities that are setting bold targets. I welcome the initiatives of the thousands of private enterprises - including major oil and gas companies - that are betting on a clean, green future. Energy markets tell us that green business is good business. "The falling cost of renewables is one of the most encouraging stories on the planet today. So is the growing evidence that economies can grow as emissions go down," he said. The Paris agreement's central aim is to strengthen the global response to the threat of climate change by keeping the global temperature rise in this century well below 2 degrees Celsius above pre-industrial levels and to pursue efforts to limit it to 1.5 degrees Celsius. The landmark agreement, which entered into force last November, calls on countries to combat climate change and to accelerate and intensify the actions and investments needed for a sustainable low carbon future, and to adapt to the increasing impacts of climate change. US President Donald Trump in June announced his decision to withdraw the US from the Paris Agreement on climate change and renegotiate the deal that was agreed upon by over 190 countries during the previous Obama administration. Arguing that countries like China and India are benefiting the most from the Paris Agreement, Trump had said that the agreement on climate change was unfair to the US, as it badly hit its businesses and jobs.